Cranford No.2 – Staveley Minerals Ltd, Cranford Ironstone Quarries, Northants. This locomotive is one of a type specifically designed for ironstone quarrying duties as part of the wartime pressure to expand production. The design included full mechanical lubrication systems and a pivoted crosshead arrangement to allow for the sharp corners often associated with the quarries and otherwise a limit on working six coupled locomotives. W G Bagnall supplied a number of these locomotives to the East Midlands including “Staveley” to Pilton, “Cherwell” to Charwelton & later Byfield, “Loddington No.2” to Loddington and “Lamport No.2 & No.3” to Lamport Quarries. 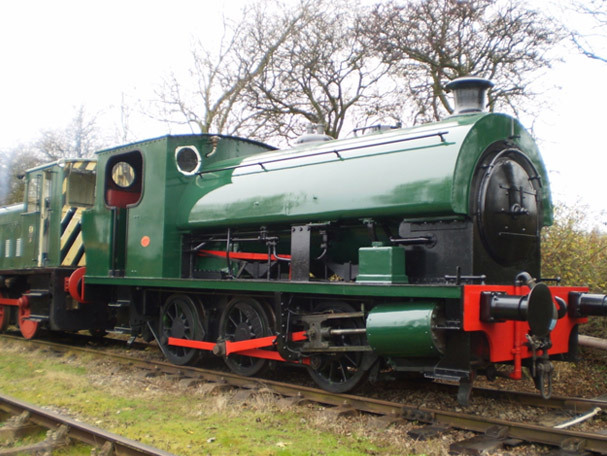 Supplied new to Cranford Quarries on 31st May 1942, and apart from a short loan to Pilton Quarries in 1946, the loco worked until they closed in August 1969. Acquired for preservation, the loco spent time at Carnforth and the Yorkshire Dales Railway before coming to Cottesmore in October 2006. The locomotive is currently at the end of its last ten year boiler certificate and we hope that it will shortly undergo an overhaul to operational condition.